Stocks caught a boost on Tuesday with Chinese stimulus now on the table. That’s giving investors a sigh of relief on the global economic front, at the same time corporate earnings are hitting the wire. Let’s take a peak a few must-see stock charts for Wednesday morning. Shares of JPMorgan (NYSE:JPM) are roughly flat on the day, despite the company missing on earnings and revenue expectations. That kind of price action makes it seem like investors are willing to buy the stock even after bad news, which can be quite bullish down the road. 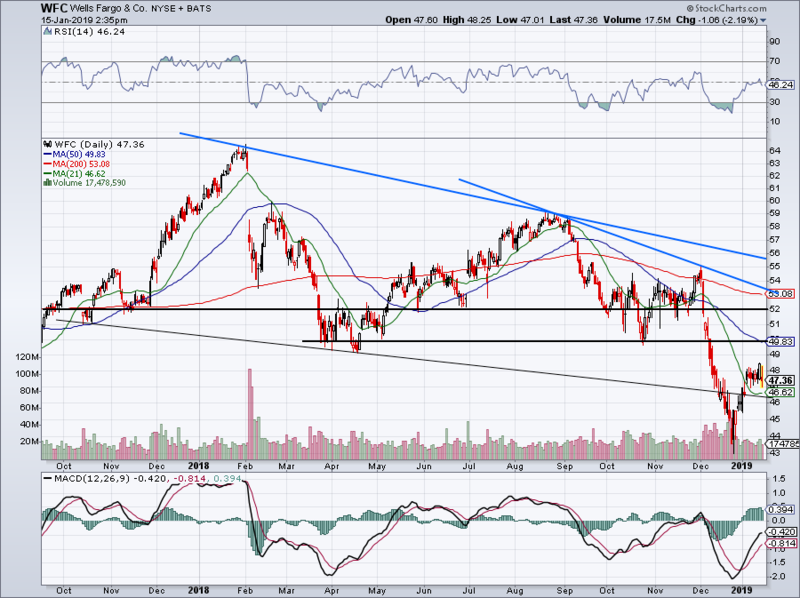 Overall, JPM will need the market to hold up though if it wants its stock to push higher. The stock is more than 10% off the lows, but is struggling to get back above $102. This mark served as a strong level of support throughout 2018 and if JPM can’t get back above it, it will likely act as resistance going forward. Should it do so, look to see if JPM can stay above the 21-day moving average. If it can’t, a break lower could be in the cards. Delta Air Lines (NYSE:DAL) also reported earnings on Tuesday, beating on earnings but missing on revenue expectations. The stock fell slightly as a result, but is now near break-even for the day. For most of 2018, DAL was been trading between $50 and $60 per share. Over the last few weeks though, the stock fell out of that range. Luckily, the 200-week moving average caught it as support. Still, the stock’s inability to get back above $50 is concerning. For current longs, consider using a close below the 200-week moving average as a stop-loss. Bulls waiting to go long can either buy now with that strategy in mind, or wait for a move back over $50 per share. Bears may want to use a close over $50 as their stop-loss as well. Netflix (NASDAQ:NFLX) is giving the bird to the bears, as shares continue to scream higher. The stock jumped 6% on Tuesday, climbing another $20 per share to $353 after news broke about the company’s plan to raise prices. The stock is now up more than 50% in less than a month — not all that shocking when you look at a chart spanning the past year. Shares are now entering overbought territory (blue circle) and I can’t imagine buying into the name now. Of course, I said that when shares were at $330 and that I would be booking profits. 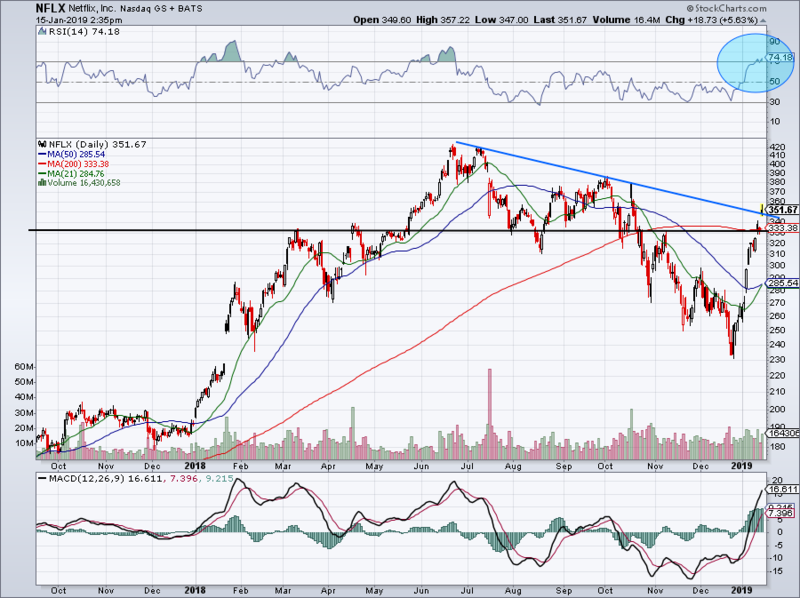 But either way, NFLX has ripped right through the 200-day and possible resistance, while gapping over downtrend resistance (blue line) on Tuesday. When will it stop? I don’t know, although bulls have to be happy to see it above these marks. 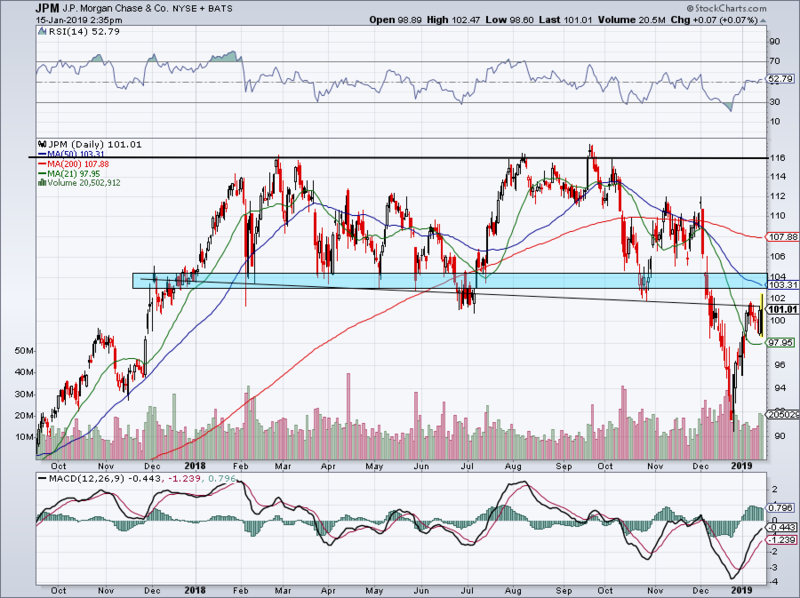 Should NFLX cool down in near term, look to the backside the $330 to $350 to buoy as support. Remember, earnings are this week — another reason for bulls to consider realizing their gains. Wells Fargo (NYSE:WFC) shares fell 2% on Tuesday after the company beat on earnings but missed on revenue. Of all the big banks, WFC has been one of the more unloved ones, along with Goldman Sachs (NYSE:GS). 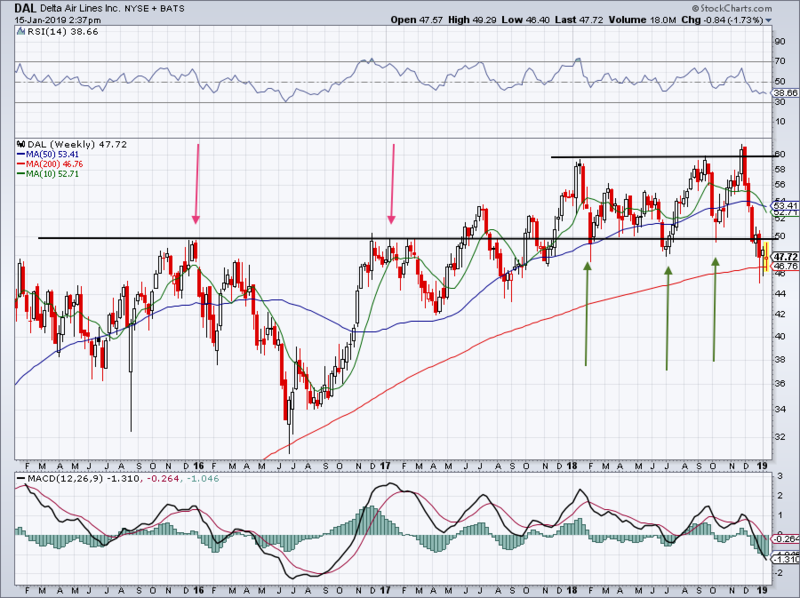 The stock continues to consolidate in this $47 to $48 area and even earnings aren’t giving us much of an idea as to which way it will break. Below the 21-day and my confidence increases that WFC will break down. Over the recent consolidation range and we can get a test of the ~$50 level. I would expect that to act as resistance on its first test. If support fails, we can get a retest of the lows, technically speaking. Article printed from InvestorPlace Media, https://investorplace.com/2019/01/must-see-stock-charts-jpm-wfc-dal-nflx/.